Children experience behavioral issues for a number of reasons - from neurological or psychological diagnoses like autism spectrum disorder or bipolar disorder - to disruptions in family status, unexpected changes in routine or even illness. Behavior issues can range from unexplained tantrums or meltdowns to emotional outbursts to toileting issues. Just like there are a variety of types and reasons for behavior issues, there are a number of treatments, including therapy, sensory diets, medication, holistic training (meditation and mindfulness) or a combination of these. This page includes links to resources where you can learn more about behavior issues or find help for your child. We also encourage you to contact us for additional personalized support. You may also wish to visit one of our diagnosis-specific concern pages for more information on behavior issues for a specific diagnosis. To see a full list of concerns, click here. Concerned About Your Child's Behavior Issues? 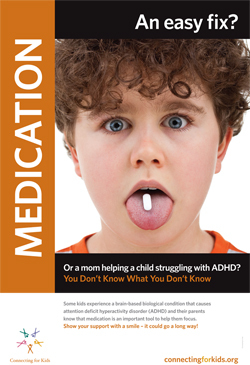 Connecting for Kids' "You Don't Know what You Don't Know" poster campaign (shown left) can help you promote awareness for your child's struggles. Learn more.